I just looked at the bottom of my Nutition Tracking page and realized that I haven't been completing my tracking every day. Hmmm. I do very well... until later afternoon.... If I made it to dinner "clean" I have had some grazing behavior tween dinner and bedtime. "Better choices" in the cabinets - you bet. But ... over calories in means over calories out. And I'm still de-icing the plane at the gate for the calories out. Injuries. Yes, really. Just as I get going...I hurt too much and find the couch again. Start stop phenomenon. Part real. Part... not believing in my goals enough. Maybe. Reliability - Doing what I say I'm going to do FOR ME. I have loved making a career of facilitating others... it has given me the experience of showing up reliably at high standards. When it's for others... the cost:benefit and risk:reward is different. Clearing this too. Accountability - redefining the Truest parts of this. Not record-keeping. But TRUTH. Vault - This is my strong suit. Always has been. 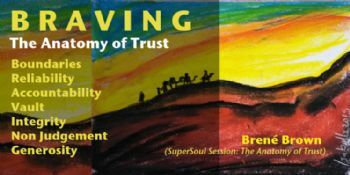 Integrity -- I knew this was my theme. A word that's been like a bubble over my head and on my sleeve for a long time... asking me to understand what it means to me and for me and with me. Me with me. Non Judgement -- This is a super hard one for me. Perfectionism makes for non-starting. Perfectionism shuts down even the most earnest moves. Perfectionism can hurt performance. And it does protect, but at way too high a cost. Generosity -- Being more available to others. And to myself. Gratitude and Abundance practice. The present moment is always perfect"
Dear Tallyfl and AAck - Thank you for reading my blog! Truly. Your friendship here has been and IS such a gift felt in my life. Thank you. Perfectionism - IS AN ILLUSON - An idea - A falsehood. OF course. We know this! THAT'S WHY "ONGOING IMPERFECT" Is such a stalwart cornerstone of recovery movements and stories everywhere... including mine. Still.... Uncovering deeper ROOTS of how 'perfectionism' = absolutism = muscles twisted in the soul journey ... It's deep. Deep. Dear ANNIEONLI - I love your voice = so direct and so real ... and your humor! You are so wise - and dancing with you in the spark is Luminious. I had to stop believing perfect was even real. And when I drill down in my actual experience repertoire, perfection doesn't exist. I mean even if someone looks at a pretty rose and says, "perfection!" they're only using the word as a description of beauty. It's not truly perfect. What IS truly perfect in this world? Search for something that is. As you begin to realize that nothing is perfect, only that the word is over-substituted for amazing, then realize that there is no need to strive for perfect. Go ahead, bring me an example of perfect, and I'll tell you why it's not truly perfect. So see? No need to pursue that unicorn, LOL. BRAVING is a deep process to wrap my head around...as well as her perfectionism definition. I hit and miss on certain points ...like I’m half way perfectionist and half not, because I have restrained my brain to know that I’m worthy and enough. But those thoughts need constant reinforcement when battling the outside world of criticism. We are a constant work in progress on that journey, that isn’t for certain!! Keep on growing and learning and changing for the better, my friend! Your on your way just by recognizing what needs to be tweaked for the better! Perfectionism is the enemy of the GOOD! Perfectionism is the enemy of PROGRESS! Leave it behind you, girlfriend. 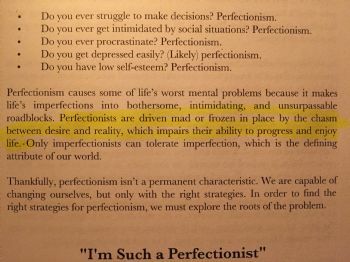 Enlightening what you wrote about perfectionism. Ah.